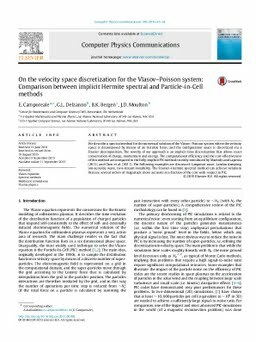 We describe a spectral method for the numerical solution of the Vlasov–Poisson system where the velocity space is decomposed by means of an Hermite basis, and the configuration space is discretized via a Fourier decomposition. The novelty of our approach is an implicit time discretization that allows exact conservation of charge, momentum and energy. The computational efficiency and the cost-effectiveness of this method are compared to the fully-implicit PIC method recently introduced by Markidis and Lapenta (2011) and Chen et al. (2011). The following examples are discussed: Langmuir wave, Landau damping, ion-acoustic wave, two-stream instability. The Fourier–Hermite spectral method can achieve solutions that are several orders of magnitude more accurate at a fraction of the cost with respect to PIC.